Home » Email vendor Selection Articles » What email reporting do you need from your ESP? When you’re deciding to switch ESPs or reviewing your strategy with your existing provider, there’s a huge amount to consider. It’s easy to get distracted by a swanky email editor or amazing account managers – but don’t overlook the importance of reporting. It’s easy to slip into the mindset that all you need is a quick review of open rates to reassure yourself that nothing went drastically wrong. After all, life as a marketer is busy and analyzing statistics is time-consuming at best. However, you should insist on getting the right reporting from your email provider, because you need it to fine tune your email marketing campaigns. • Opens and clicks: If you’re not looking at these then you may as well give up all marketing, sit back and simply hope for customers to come to you. • Opens and clicks over time: The timing of your emails is crucial to success. Use opens & clicks over time to watch for spikes and dips that suggest changes to your usual campaign timing. Are you sending at the time of day your recipients are most likely to engage? • Replies: Check how many replies were sent and that you are receiving and responding to these – customer service is an important factor in marketing and branding. Next to statistics where “bigger is better”, there are also fundemental ratio’s that you would rather not have too high, but are equally important to monitor and act on. • Bounces: Soft- and hard-bounce rates point toward the quality of your data – is it old, are addresses now out of date, do you need to work on list hygiene? A sudden change may point to a content issue. • Unsubscribes: If they gradually creep up, it might be time for a content refresh. If a campaign gets an unusually high (or low!) number of opt outs, take the time to work out why and learn a lesson for next time. • Blocked: You need to know how many people mark your emails as spam or ask their email client to unsubscribe them via a feedback loop. The higher the number, the more you should consider making your unsubscribe link more prominent – you should be preventing people from leaving you is with your engaging content not by hiding the unsubscribe link! • Opens and clicks by device: No matter what percentage of your opens/clicks are on smartphones and tablets at the moment, it’s bound to be increasing. At the very least, set yourself a threshold at which point you will move to a responsive design email template, if you haven’t already! • Heat map of clicks/link popularity ranking: Use this data should to understand how recipients choose to engage with your emails and to encourage them to do more of what they’ve been choosing to do anyway. • Integrated reporting: This will save you time by not having to export and cross-reference reporting data in your CRM or analytics program. 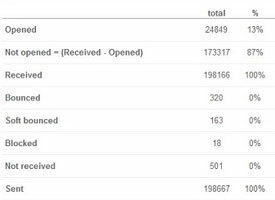 • Recipient behavior filters: Do you know which of your recipients hasn’t opened an email in the last three months? If not, find out – and set up a campaign to re-engage these contacts. 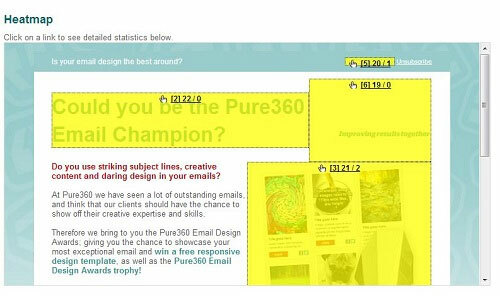 • Results of split content/subject line comparison tests: Each time you run any kind of email A/B splittest, make sure the results feed into your next campaigns. Even better, use these results to segment your lists and send more tailored campaigns. It’s not just about numbers, it’s important that your reports are presented clearly and in a way that leads to easy analysis. If your ESP gives you all the data you need, but you would prefer it in a different format or summary, just ask them! Any company worth their salt should be able to provide custom reporting if it means helping you improve your results. This is often overlooked, but could be a very important requirement when you are choosing an ESP. There are even more types of reports available, but these mostly depend on your specific business. Taking this to another level, think about what you *must* achieve from your email marketing in terms of ROI and conversions. Present this and work backwards with your ESP to clearly define what reports you need (and what figures you need to be seeing within). If you want to achieve a certain ROI from your email marketing, how many conversions do you need per campaign? How many clicks will this require? And how many opens do you need to get these clicks? This approach takes full advantage of one of the strengths email marketing has above other marketing channels –the chance to see and use tangible results to make powerful improvements to future marketing campaigns.